This workshop will go over how to strategically analyze a course and how to choose the best handing for you and your dog. These skills will be helpful when walking courses and when multiple handling options are present. Handlers should have an understanding of front and rear crosses and dogs should be able to sequence 8-12 obstacles. Space is limited to 5 dogs. $60 per dog. This seminar will go over the AKC game "FAST". Handlers will learn how the game is played, learn how to strategically plan a course and work novice to open level distance challenges. Dogs should be able to sequence 8-12 obstacles. $60 per dog. To enroll for a workshop please fill out the box below with your dog's name and workshop you'd like to sign up for. E-mail confirmations will be sent along with a Paypal link to pay. Payment will hold your spot. Seminars will be filled in order of emailed entry received. An emailed invoice will be sent to confrim entry and payment must be submited to hold the spot. There are no refunds unless working spot can be filled. This seminar is open to novice – masters level. Students may sign up for one or both sessions, please specify which, or both. Students get timed working sessions and can work to their specific level of training. This seminar focuses on turning cues on jumps, tunnels, weave poles and one contact obstacle. Learn to pick the right techniques for you and your dog to navigate course work. Students will work on mastering the skills they pick to practice in the coursework. 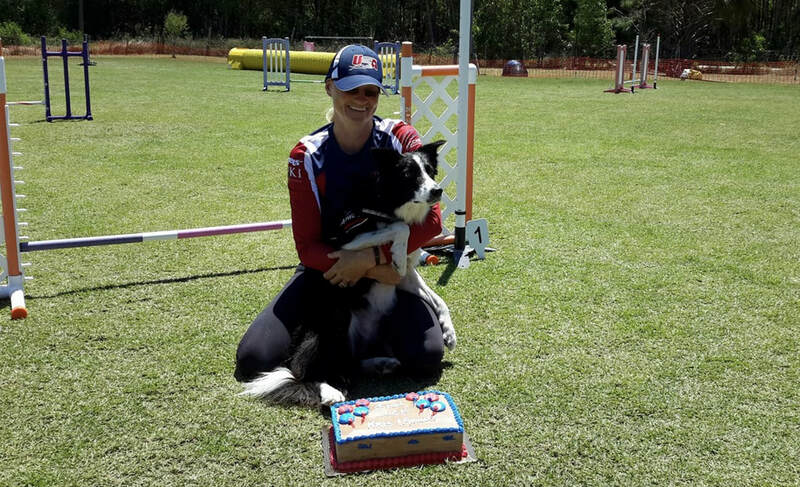 Instructors will teach or review the most common used handling skills that are a must for all agility competitors. Mastering Coursework- This seminar is open novice and all higher levels. Students get timed working sessions and can work to their specific level of training. Longer sequences will be used. This seminar will focus on teaching you how to be physically consistent when executing handling. Students will learn how to read courses and execute the correct handling positions to create fast lines and tight turns. I mix of obstacles will be used in this seminar. This seminar focuses on perfecting agility basics, obstacle skills and handling skills. Short sequences will be used with a variety of equipment, weave entries, contact behaviors, jump turns, sending cues and independent obstacle performance will be worked. This seminar is perfect for any level, dogs who need to build confidence, handlers who want to improve speed and focus, or dogs who need more reinforcement in training. Handlers will learn how to build independent behaviors. 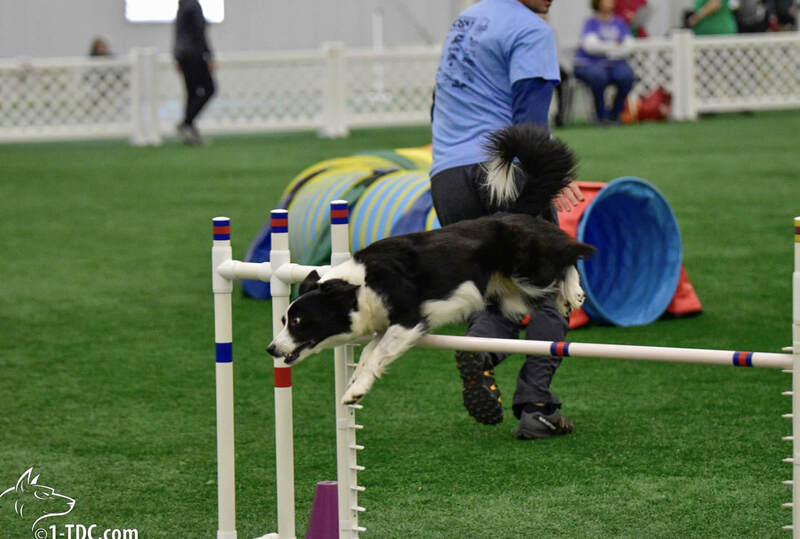 Registering for this seminar commits you to a workng spot, accepting the rules/policys of Kim Seiter Dog Agility as well as payment of the seminar(s) ennrolled once confirmed. 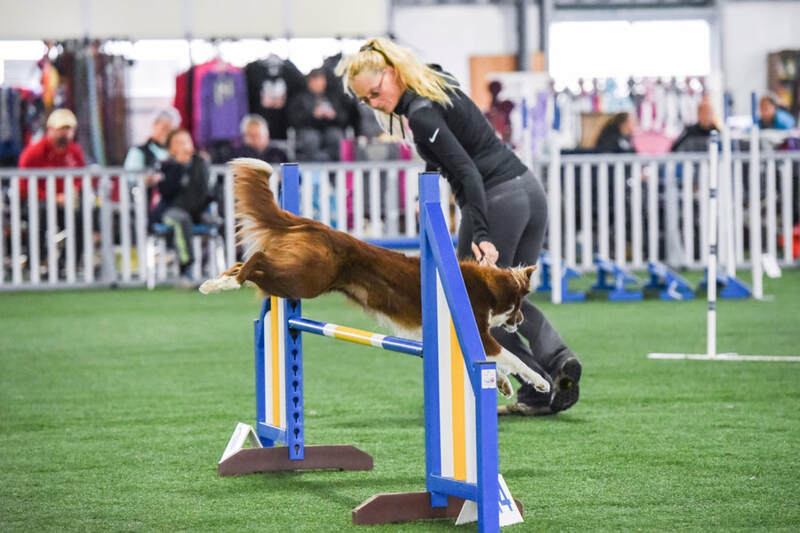 Kim Seiter Dog Agility - General Guidelines & Policies In order to assure the safety of students, instructors and dogs attending classes and events at Kim Seiter it is essential that everyone follows the school guidelines. Please help us by abiding by the following. To assure everyone’s safety, instructors and staff are instructed that anyone found to be violating the guidelines may be asked to leave the school 1-Dogs are not allowed be off leash when outside at any time. Our parking lot areas are busy this is for your own safety! 2-Clean up all dog waste outside using the clean up stations provided. If an accident occurs inside, please use the supplies designated to clean the area. Deposit all solid waste in outside trash can. 3-Exercise your dog – using a leash. Please use the on the grass areas to the front side and back of the Kim Seiter Dog Agility and avoid walking by the other business’s and their property. 4-If a dog is deemed to have serious aggression they may be asked to leave the school at an instructor’s or staff member’s discretion. No refund will be given for unattended classes. 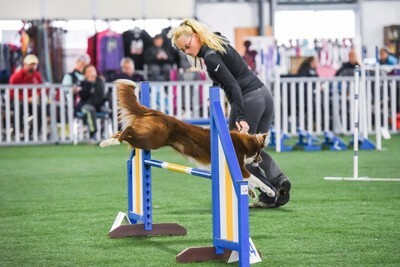 We define “serious aggression” as intentional injury or intent to inflict injury to either humans or dogs, thus making the dog a liability to Kim Seiter Dog Agility and its clients. 5-Any instance of a human or dog being injured in any way at Kim Seiter Dog Agility must be reported immediately to an instructor or staff member in charge. 6-Children under the age of 12 must be under the direct supervision of a parent or guardian at all times. 7- Class Registration: Once registered for class and registration is confirmed in email, payment must be made by the first day of class. Late payments over seven days of the first day of class will be subject to a 5% late fee. Payment can be made online using credit cards, check made payable to Kim Seiter, or cash. 8-Refunds will not be issued one a session is in process. Credits will be issued only for extreme illness or injury to dog or handler that prevents them from attending the rest of the session. Students must provide documentation of the incident from the Veterinarian for the dog, or Physician for the Human. Kim Seiter Dog Agility reserves the right to not offer credits. 9-Class Registration: When you register for a class, you are holding a space in a limited-sized group. Dropping out of class mid-session still requires you to pay for the full session enrolled, and no refunds will be given at any time. 10-Missed classes: If a student is unable to attend a class for any reason they make come to another class of a comparable level with the instructor’s approval. These make-up classes MUST be done in the session enrolled and will not be held to be used in future class sessions. This policy is a courtesy an any student abusing this will be denied use of this courtesy and no make-up classes will be allowed. 11-Private Lessons: All new clients must pre-pay for private lessons once scheduled. All current private lesson students must pay at the time of the scheduled lesson. Any late payments will be subject to a 5% late fee. 12-The owners of Kim Seiter Dog Agility reserve the right to refuse services to any person who exhibits behavior that is detrimental to the school. Kim Seiter Dog Agility - Liability Waiver___________________________ I understand that my attendance at Kim Seiter Dog Agility classes, private training sessions, facility rentals and or Kim Seiter Dog Agility events is not without risk to myself, members of my family and/or guests who may attend, or to my dog(s). Some of the dogs to which we may encounter may be difficult to control and may be the cause of injury even when handled with the greatest of care. I understand that dog training may require off leash control which could present risk of injury for both the dogs and handlers even when the greatest amount of care is taken to ensure safety. I hereby waive and release Kim Seiter Dog Agility and its owners, members, instructors, and agents from any and all liability of any nature for injury and damage which I, my family members and/or guests, or my dog(s) may suffer, including specifically, but not limited to, any injury or damage resulting from the action of any dog, including my own. I expressly assume the risk of any such damage or injury while attending classes, private lessons, facility rentals or any event being run by Kim Seiter Dog Agility or while on the company grounds or surrounding area. In consideration of and as inducement to the acceptance of my enrollment for Kim Seiter Dog Agility training, I hereby agree to indemnify and hold harmless Kim Seiter Dog Agility and its owners, members, instructors, and agents from any and all claims, or claims by any member of my family or any other person accompanying me to any training session or function while at the company facility or the surrounding area as a result of any action by any person or dog, including my own. By my online registration, class enrollment and signature I declare that I am at least 18 years old, have carefully read and fully understand the foregoing, and also that my dog’s vaccinations, including rabies, are current. Kim Seiter Dog Agility Client/Pet Photo Release Form During your pet’s time at Kim Seiter Dog Agility, we may take photographs in a class situation. There may also be times that we take pictures of the facility that may include your dog(s). These pictures may be used in different forms of advertising, displays or promotions. Some examples may be brochures, flyers and our web-site. By granting my consent to the use of my photograph, name or likeness, I understand and agree that I do so voluntarily and knowingly, and without any expectation or promise of additional compensation or other benefit should Kim Seiter Dog Agility use my pet’s photograph, name and likeness in its internal or external promotional or advertising materials. I have read the above guidelines and agree to abide by them. 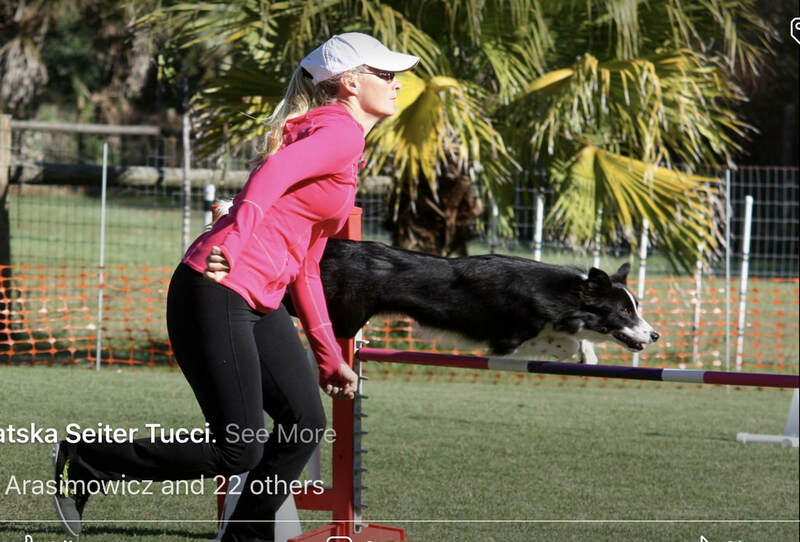 5/8, 5/9 and 5/11 (2018) Agility Seminars with World Team members Kris Seiter and Chris Tucci! 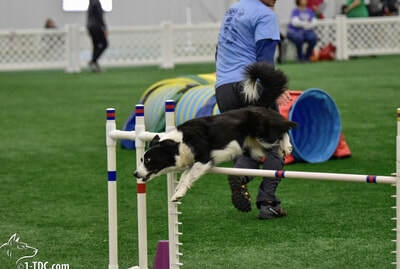 Agility seminars are open to all levels intermediate or higher. Each team gets timed working sessions as to accommodate all students to work at their appropriate skill level. The seminar experience allows students to get focused skill training as well as learn by watching more advanced teams. 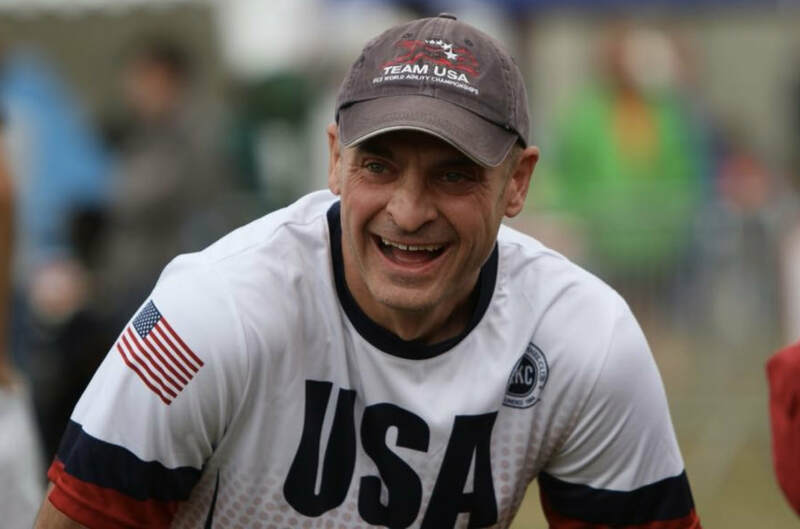 Kris Seiter and Chris Tucci Agility seminars are open for registration. All 3.5 hour seminars are $125. Please Pay online using Paypal to confirm a working spot. No refunds will be given after 5/6 unless your spot can be filled. This seminar will break down various handling skills and put them into small sequences. This seminar is for teams who need practice understanding and executing various handling cues and have the dog perform them consistently. Examples of handling techniques are, serpentines, threadles, backsides, blind, rear and front crosses, and combination of these skills together. Learn the language of handling and learn how to perform the skills. 5/9 Wednesday 11:30pm-3:00pm The NEED for SPEED- getting, building and maintaining drive in handling! Even if your dog is fast learn how to handle the speed. This seminar will teach how to build drive and basic obstacle focus. Dogs must have something (toy or food) that they motivate for. Learn how to improve your dogs obstacle focus and your handling skills while keeping the dogs speed. This seminar is open to all levels as only jumps and tunnels will be used. This seminar will focus on clearly defining turning cues. Short sequences will be run focusing on working collection and extension in and out of turns. This seminar is for dogs who need more experience learning how to turn. This seminar is open to all levels novice or higher. Tricks Workshop is open to all levels Novice-Performer. In order to participate Dogs must be friendly, under control and able to work around other dogs. Workshop will introduce students to a variety of trick behaviors. Advanced students will be able to refine their trick skills as well as learn some new ones. This workshop is a great warm up before the tricks test! AKC Tricks tests to follow workshop 12:30-5pm. Students who sign up for the workshop and want to be tested following the workshop will be scheduled starting at 12:30pm. You must specify how many levels you wish to be tested so an appropriate amount od time can be allocated Each AKC test is $20- this does not inclue the fee for the AKC which has to be sent in after the test is passed. Confirmations for entry to the Workshop and AKC Tricks test will be in order of receipt. Open to all levels Beginner, Novice, Intermediate, advanced and Performer. Students will be invoiced for payment once registration is recieved. See below for a list of the AKC Tricks required per level. CGC Certificate on record with the AKC counts as 5 tricks. If CGC title isn’t earned then 10 tricks are needed for Novice title. Must have first 3 trick titles on record. The dog/handler must perform a tricks routine that includes at least 2 intermediate tricks an 2 advanced tricks. 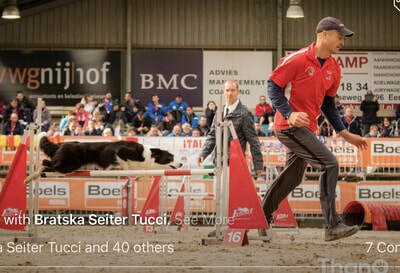 5/2, 5/3 and 5/5 (2017) Agility Seminars with World Team members Kris Seiter and Chris Tucci! Kris Seiter and Chris Tucci Agility seminars are open for registration at 9am on 4/10, for KS Dog Agility students only. Registration will be open to to the general public on 4/17. All 3.5 hour seminars are $125. Email registration confrims a spot and all payments must be made by 4/21 to hold the spot. This seminar is now full. Teach your young dogs to do agility fast from the start. This clinic will focus on teaching the handler how timely reinforcement is key to creating a fast and driven agility dog. Lots of circle work, recalls and tunnels will make this clinic fun for all dogs needing some motivation. For puppies and young dogs, this clinic will help create excitement for their future agility careers. This clinic will focus on running full Masters/International jumping courses. 12 weave poles, jumps and tunnels will be used. No more than 25 obstacles. Each dog/handler will run the course twice before the trouble areas are broken down. Focus will be on running the entire course clean the first time. Vital seconds are lost during and at the end of runs due to your dog slowing down to adjust their speed to yours. Having strong distance skills and the "Go" extension cue allow freedom on course for the handler to move to key positions. Running the exact same lines with only a few feet apart keeps the dogs in handler focus and teaches them to continually adjust their speed since they don't know where they are going next. This clinic will focus on teaching your dog to drive away from you on course when you ask them to and to finish the course on their own. Lateral and forward distance skills will be covered. Often leaving the handling in the dust at the end of a run is a good thing. So you have good weave pole skills, what's next? This clinic will focus on all kinds of handling before and after on weave poles. When you don't worry about your dog weaving, you can focus on getting where you need to go on course. This clinic will work all kinds of handling and skills on solid weave pole performances. Only six poles will be used to force good handler timing. Difficult entries and exits will be part of each skill. This seminar will focus on building drive and confidence on the teeter. All handling on this obstacle will be reviewed and trained. Examples of skills that will be taught; front, rear, and blind crosses, distance and serpentine skills. This seminar is open to all teams regardless of the handling level as long as the dog can perform the teeter at height. This seminar will focus on getting consistency to your weave pole training and performance. Many dogs struggle learning to weave and this obstalce can be one of the last skills your dog needs. This seminar will teach you about how to clearly cue weave pole entrances, support the weaving behavior, and get successful repetition that can be rewarded. This seminar is for dogs who have a basic understanding of weaving but lack consistency to the performance. This seminar teaches a system of how to make handling decisions when walking a course. Learn how to read the dogs running line and make the right handling choices for your dog. This seminar will go over a variety of handling skills and where you use them on course. This is open to any dogs at the novive level or higher. This seminar will focus on what to do with your feet. If you find yourself always putting the wrong foot in the wrong place this seminar is for you. All courses can be run utilizing just leg cues. This seminar will help you learn how to focus on using your feet to communicate the correct path your want the dog to go. This seminar is open to any level agility team. This seminar will focus on impulse control skills in various positions relative to the handler. Dog will work on leash using either a (harness, collar, or gentle leader) and be out on the floor together. All positive reinforcement training will be used to clarify to the dog the desired behaviors. Toys may also be used in between exercises or as a reward for each exercise. The goal of this seminar is to practice more control around distractions and to improve working focus. Seminar to be rescheduled-Weave Poles for Beginners- This seminar is open for dogs who are learning to weave or have started the training but need a better understanding of the process. The skills covered will be operant behaviors for the entry position, right & left lead leg turning skills through the weave poles. Upright 2x2 weave poles will be used and dogs will be weaving 4 poles at the end of this seminar. This seminar will focus on front crosses. We will discuss proper front cross placement and where they work best on course. Handlers will learn how to time their crosses and how to get where they need to be. Only jumps and tunnels will be used. Brush up on your dogs fitness skills this winter! We often forget about the fitness exercises our dogs learned in foundation classes. 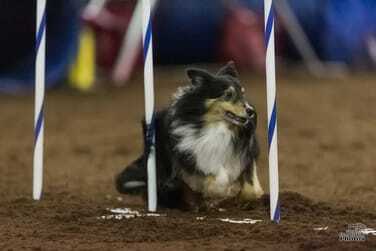 All dogs, beginners to seasoned competitors should take time to focus on fitness and body awareness training. This seminar will cover ground work, work on balance obstacles, and teach some pre-competition warm up exercises. Still unsure about some of those One Mind Dogs moves you learned in class? Not sure exactly which handling scenarios to use them in? The first half of this seminar will break down the forced front, german turn, tandem turn, and reverse wrap. All teams will work on a jump at the same time. The second half of this seminar will focus on putting these maneuvers into a course. Handlers will learn how to look for the best handling option for their dog and where to best execute them. Workshops are all 3.5 hours long. $125 per session for students enrolled in classes. 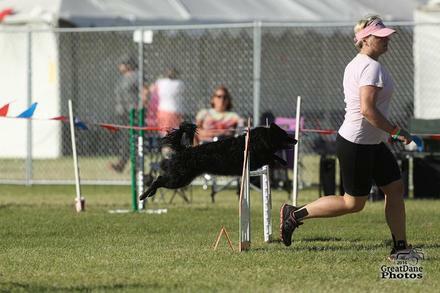 $150 for non- KS Dog Agility students. Workshops will be closed at 8 students and I will take names for a wait list. Payment is due by 10/5 to hold a spot. Workshops will be offered to the general public 10/3 so please email ASAP to hold a spot. Working spots will be taken by email, order of receipt, until all working spots are full. Please email ksdogagility@yahoo.com to confirm a spot. Also list desired seminar and provide a second choice in case the one you want is full. This workshop will cover jumping skills; extension, collection, side changes (front, rear, blind) as well as clearly executing handling cues relative to jumping. Open to all students past the beginner level. Jump heights will be adjusted for dogs skill level and age. Each student will have equally timed working sessions. This workshop will work on skills needed for independent weave poles. Dogs should have an understanding of the weaving behavior but do not have to be completely consistent on the behavior. Skills that will be practiced will be Extension, collection, and side changes. Open to all students whose dogs can weave 6 poles (although 12 poles will also be used). Jump heights will be adjusted for dogs skill level and age. Each student will have equally timed working sessions. This seminar will work on how to choose appropriate handling cues and mastering the execution of those skills. Open to all teams that are fluent in most handling skills and can work longer sequences. Jump heights will be adjusted for dogs skill level and age. Each student will have equally timed working sessions. This workshop cover skills that young dogs need for the sport of Agility. Many of the foundation handling cues that can be trained to puppies / adult dogs before doing more complicated handling and sequencing. This workshop is open to all ages and all levels of dogs but the focus will be on defining and training behavior cues. Dog should have completed a beginner class. Dogs must be friendly and able to be around other dogs. Dog must already understand how to learn with toy or food reinforcements Older dogs may also take this seminar to refresh basic skills. Each student will have equally timed working sessions. This workshop will cover learning to see the dogs line and how to handling that line skillfully while layering obstacles and using distance. This workshop is all higher level teams who understand most handling skills. Longer sequencing will be used. Each student will have equally timed working sessions.